Of all the plants to grow in containers, lilies are amongst the most satisfying. Most lilies prefer warm, well-drained, open soil, hate winter wet around the bulbs, and can be martyrs to mollusks. Some require acid soils. All like humus and often prefer to sit with their feet in the shade and their heads in the sun. If you don't have those conditions in the garden then you can provide it in a container. Depending on where you live bulbs are available in either autumn (fall) or spring. In cold areas they are best planted in spring but in milder areas they can be planted in autumn and overwintered in their pots. Whichever season you plant the procedure is the same. Lily bulbs are quite large and will need a good-sized pot for best results. I generally use three or four to a 12-inch diameter pot. They also have to be buried to a good depth. 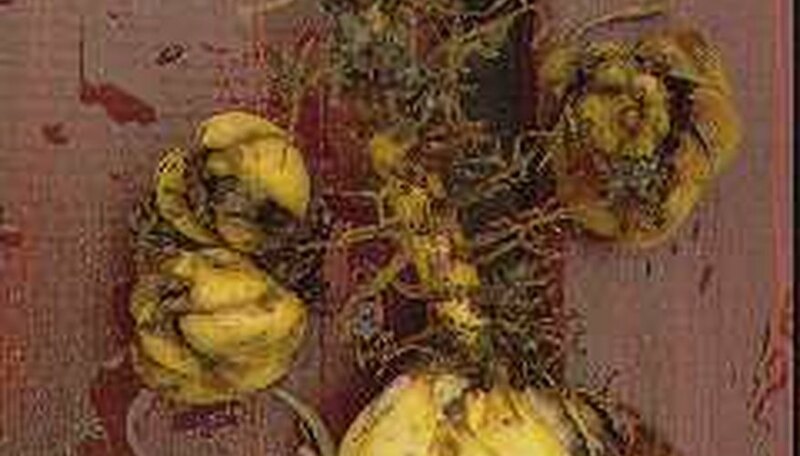 The photo of the bulbs - these are the white 'Casa Blanca' - shows the old stem and the roots that grow from it. Most lilies root along the stems and must be planted deep enough for these roots to develop. 3 to 4 times the height of the bulb works for most. Prepare the pot by cleaning it inside and out. I use a hard bristled floor brush. Good drainage is essential and broken crocks placed over the drainage hole will ensure this. 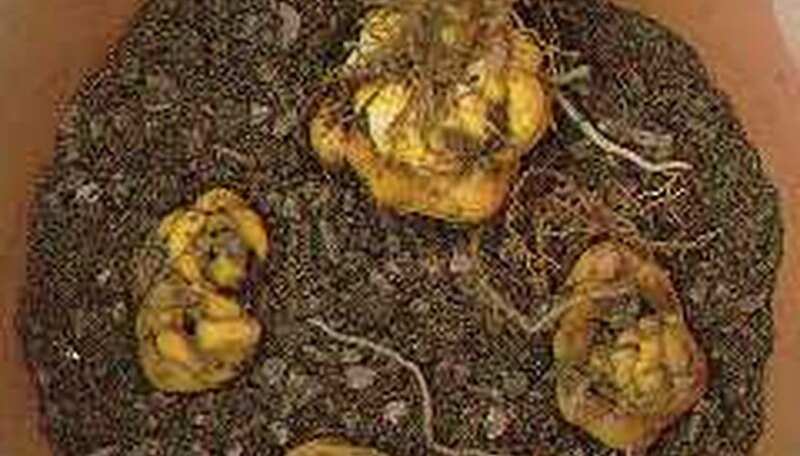 These are then covered with a layer of good container soil - acid for many Asiatic hybrid lilies - and the lily bulbs placed root side down on top of the layer. Fill up with more container soil to give about two inches of space at the top. 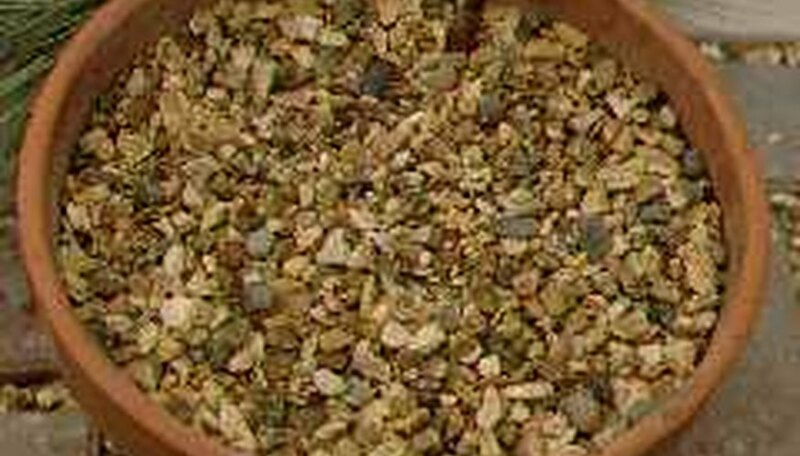 Use one inch to house a top dressing of gravel to protect against evaporation and slugs but leave at least an inch free. This provides a reservoir area for watering. 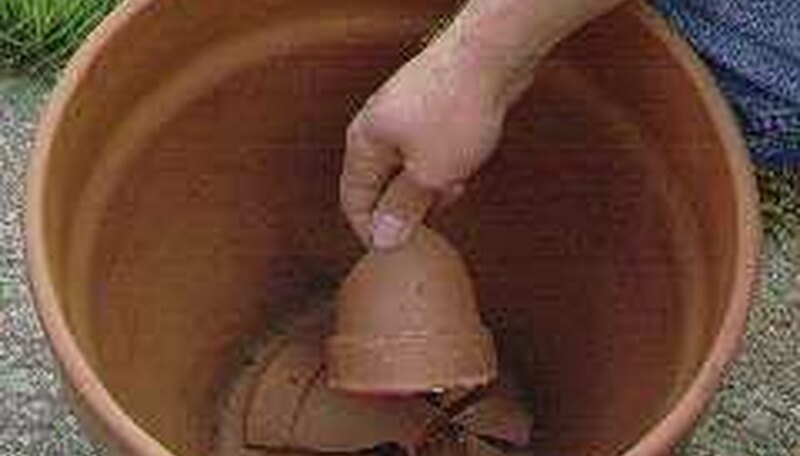 The pots can then be moved to a cool, sheltered resting area for the roots and stems to develop and brought into a more prominent position as the flower buds begin to develop. With autumn planted bulbs you might have to wait for six months to see the new shoots emerging in late spring but once they do emerge, growth is rapid, fuelled by the mass of the bulb. Flowering time is dependant on the variety grown - which means that you can plan for a succession of bloom. This summer I started with pots of the June flowering, powerfully scented Lilium regale and yellow and orange flowered hybrids, followed by golden trumpeted 'African Queen' in July, white flowered 'Casa Blanca' in August and the pink flowered Lilium speciosum 'Rubrum' which carried the succession into September. None of these needed staking - but if wind is a problem then thin bamboo canes can be used around the edge of the pot and the stems supported. By late autumn the lilies will have begun to die down again. This is the time for repotting in milder areas or lifting for storage where winters are harsh. Cut down the old stems and gently tease the container soil away from the lily bulbs. Unlike stored bulbs, they should be fresh and white or yellow in appearance. With luck - and the aid of regular watering and feeding with good container fertiliser through the summer - they will have increased in size and, quite possibly, produced small offset bulbs which can be separated and grown on in their own pots. If you have to store them over the winter for spring repotting they must be kept cool and not allowed to dry out. Given enough room in a cool but frost free garage or outhouse, they can be stored in their pots. The alternative is to store them in trays, covered with slightly damp container soil to keep them moist and plump, and dusted with a little organic fungicide to prevent decay. Inspect regularly through the winter to ensure that there are no problems and replant as soon as the weather begins to warm up and pots are unlikely to freeze solid. About the Author John Richmond is a keen gardener who lives and works in the South West of England. He has a scientific background as a professional ecologist. He has written occasional articles for gardening and other magazines in Britain since 1984, specializing in garden wildlife issues and hardy plants.